Yakima, WA – Borton Fruit has ramped up our packing production to meet market demand for newly harvested fruit. “Harvest has been very good so far, with great quality and consistent volumes. Packing timetables are at the will of weather, fruit maturity and picking crew availability but our program is looking to be on schedule for an excellent season,” States Eric Borton, our VP of International Sales & Marketing. Both the Borton Main Plant and our West Chestnut plant are packing full pack-schedules of new crop varieties. 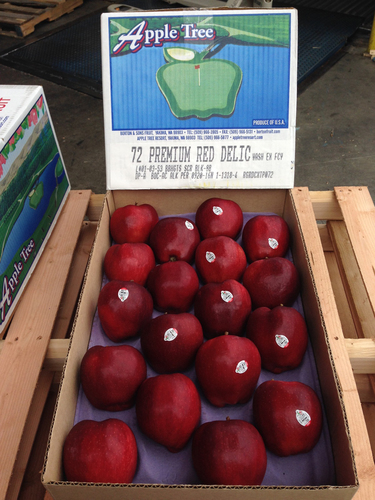 Last week we started packing our new crop Red Delicious apples as well as our Bosc Pears. “The Red Delicious have been clean, very few defects so far. All lots received have had great pressures, all being really crisp,” States Chad, our Quality Assurance Manager. The Bosc Pears have been consistent in sizing, color and quality as well, currently peaking on our manifest in US#1 70s, 80s and 90s. Our 2014 crop is shaping up nicely and proving to be yet another record crop under Borton’s belt. Most of the growth in volume this year is coming from replacement of old orchards into high-density plantings that produce higher yields and better quality fruit. “Many of our newer high-density plantings (also known as the v-trellis system) are getting to a mature enough age that they are producing great volumes and outstanding quality. As a company, we have made the commitment to continually upgrade our orchard plantings with the goal of providing the market with the best fruit possible,” notes Eric. What’s next? 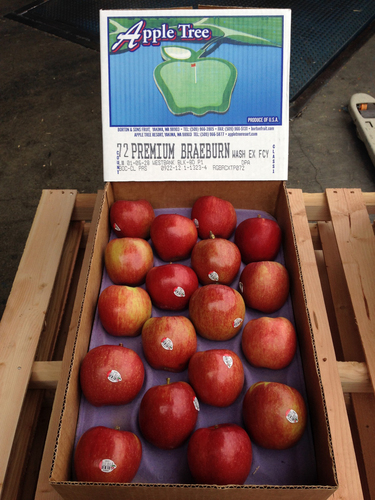 This week we’re adding Braeburn and Red Rome Apples to the mix. We started packing our Braeburns today. “So far so good,” says Chad. “We’ve seen very clean, good colored Braeburns being packed on the line today.” Red Romes are currently on our schedule for Friday. Stay tuned for more new crop information! Borton Fruit will be picking fruit through November, ending the harvest season with our Pink Lady/Cripps Pink Apples. If you’re attending the PMA this year, come by and see our new crop Apples & Pears at booth #1216!